Here’s a novel idea: this issue of Titan Comics’ Eleventh Doctor, while featuring the Doctor, doesn’t star the Eleventh Doctor – at least, not as part of the action. Instead, he’s confined only to flashbacks in the mind of Alice Obiefune; it’s a lovely scene incidentally, although you can’t help but wonder how Alice has memories of him in Vincent and the Doctor, The Pandorica Opens/ The Big Bang, and A Good Man Goes to War (and if I’m not mistaken, The Beast Below). Although I buy The Eleventh Doctor title to see My Doctor, I’m actually not complaining at all because The Organ Grinder, written by Si Spurrier with art by I. N. J. Culbard, is a wonderful comic. If you’ve been following this series, it should come as no great surprise that Alice has now found herself in the Time War, and meeting the War Doctor – although naturally he doesn’t go by that name. This is virtually unexplored territory (save The Day of the Doctor and Engines of War), so it feels like we’re treading dangerous ground. For Alice, this is literally the case as, at the conclusion of #2.10, she was sucked up by something resembling a black hole in the ground. She finds herself at the mercy – ha! – of the Daleks… though you might not initially recognise them as such. The creative team has given us different versions of the monstrosities that we know and love. These are creatures who know their lives are limited: once the Daleks win the Time War, as they’re impure, they’ll be destroyed. And they’re fine with that. Alice presents a problem. These Daleks realise she’s from the future. But there is no future for the human race, or indeed any race at all, if the Daleks win. This is when she drops the bombshell that the Daleks aren’t the winners. This opens up a few narrative possibilities, which makes the future of this comic fascinating. How will the War play out if the Daleks already know they’ll lose? 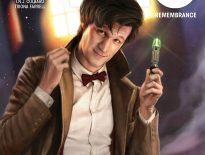 Okay, so the Doctor will still be forced to use the Moment, but between “now” and “then”, who knows what will happen? Well, clearly co-conspirators, Simon Spurrier and Rob Williams, the writers responsible for concocting this storyline, and what a great job they’ve done! I’ve not been a massive fan of the more psychedelic elements of the tale so far, but you can tell they’ve been building to this great conclusion (although there are still numerous issues to go before it properly finishes). #2.11 works much better than #2.10, as a lot more goes on, and the visuals are a lot more definite. Culbard’s art really captures the scale of The Organ Grinder – which is to say that it’s both grand and minimalistic. 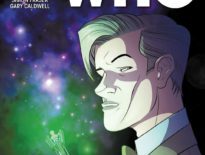 Because as the Time War rages, there are plenty of quitter moments as we get to know a new TARDIS dynamic, between the War Doctor, Alice, and… well, it would be too much of a spoiler to reveal the identities of the other two. 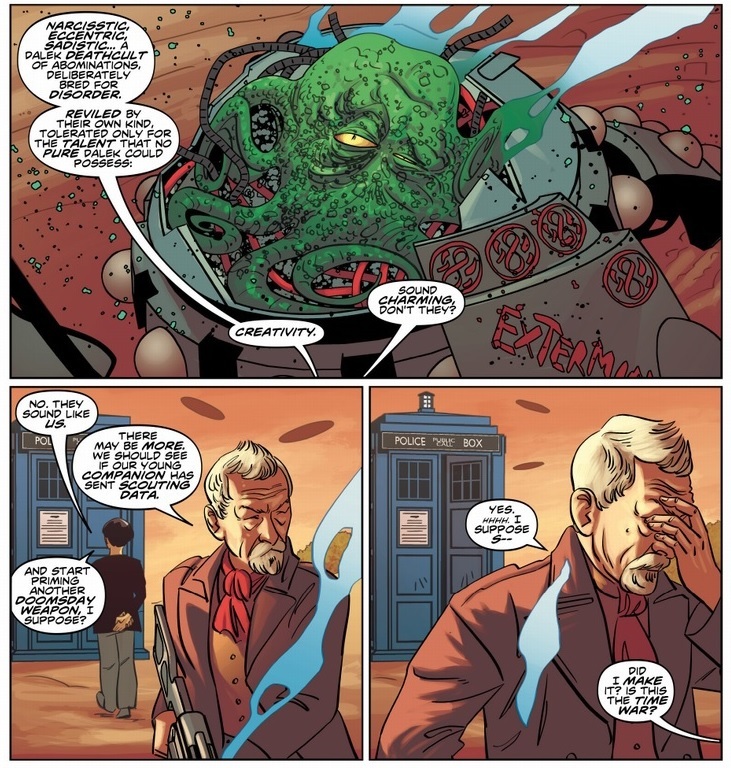 And kudos, too, to letterers, Richards Starkings and Comicraft’s Jimmy Betancourt: the types used for these different Daleks are playful, inventive, and genuinely feel like something new. This is a very exciting and promising issue, and I can’t wait to find out how this all plays out. 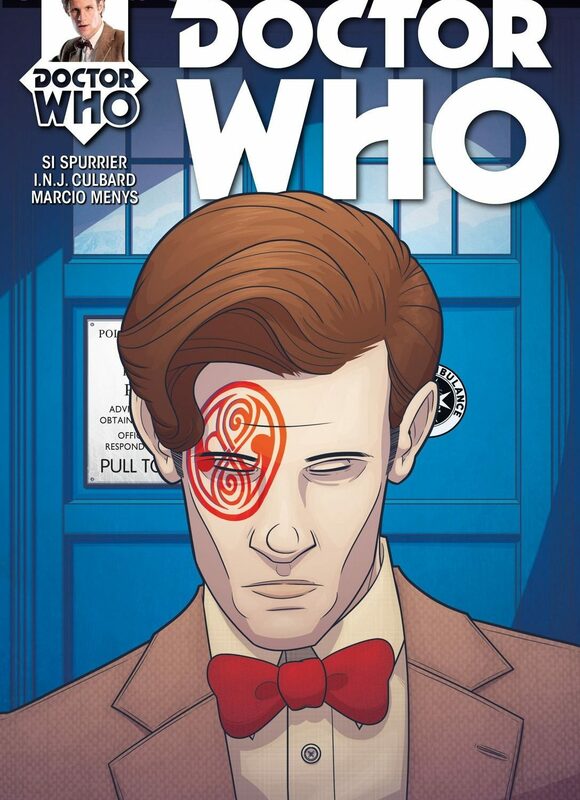 The Eleventh Doctor #2.11 is out now, priced $3.99.